Phew! It's time to drop down a gear or two and glide into the weekend - this week has been so busy! The autumnal weather has been perfect here in London this week: crisp, cold and foggy mornings that clear as the sunrises. I'm hoping it will continue into the weekend so that there can be plenty of walks through the park, kicking through the leaves and admiring the inspiring colours of the season. Then, I'd like to return to this bedroom with its calming blue and white palette, grab my book and have some chill out time. What's on your weekend agenda, friends? I hope you have a fabulous weekend too. Love the pictures on the wall in this! 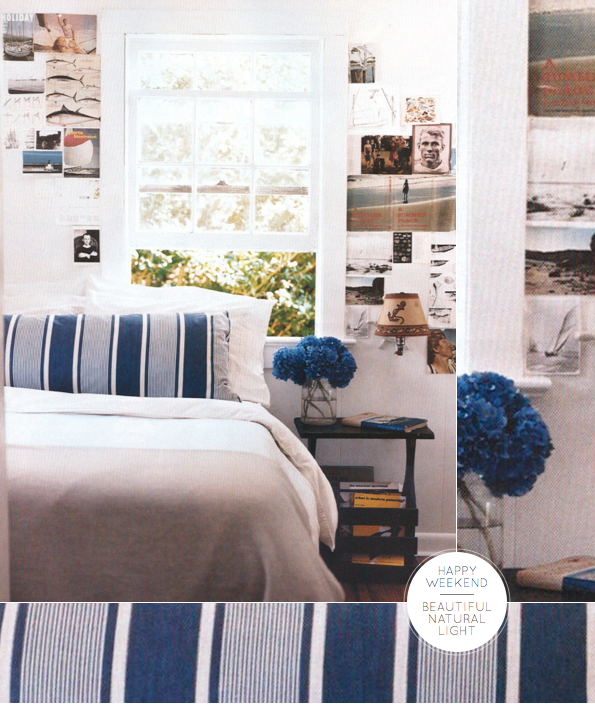 OOoo love that inkyblue and white combination! You have made me work on my bedroom today, that's for sure ;) My agenda includes taking advantage of the beautiful autumn weather we're having here! The weekend just took an unexpected turn as my mother was rushed to hospital last night. Nothing life threatening (thank God!) but quite serious. So all major plans were cancelled, but we are going to spend patches of time outside. The Autumn air is crisp and frosty, but filled with sunshine and divinity. It is SO beautiful out there with the foliage turned gold, red and yellow. I love this time of the year!! Big warm hugs to you my friend. Enjoy yours.